Home » blogposts » Join WAM!NYC for a WAMentoring session with Jamilah Lemieux, Senior Editor at EBONY magazine. 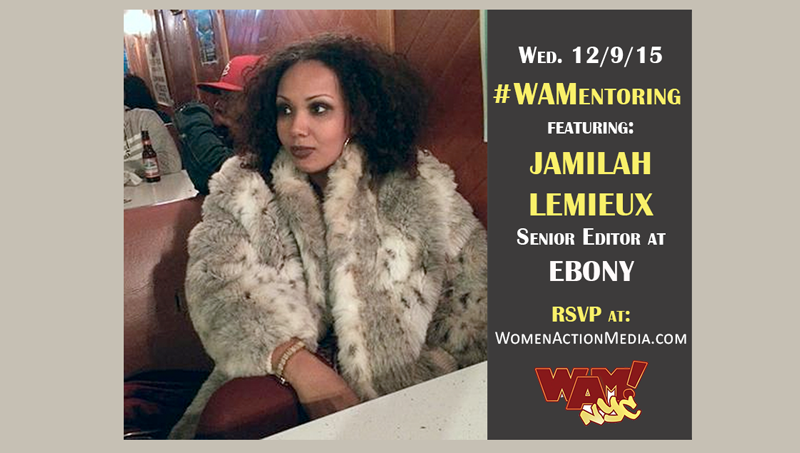 Join WAM!NYC for a WAMentoring session with Jamilah Lemieux, Senior Editor at EBONY magazine. Are you a woman looking for advice on how to take the next step in your career? Struggling to find mentorship in the digital media or journalism world? Join us for WAMentoring, an informal conversation series with some of the most accomplished members of the NYC chapter of Women, Action & the Media (WAM!NYC). This month’s mentor, Jamilah Lemieux is an award-winning, editor, writer, and speaker. She’s a leading millennial voice around issues of race, gender and sexuality. One of those pesky Black feminists who challenges the status quo, while remaining fresh and fab at all times. Jamilah Lemieux’s work has appeared in Essence, Clutch, The Nation, the Washington Post, Gawker, and her award-winning blog, The Beautiful Struggler. In 2014, she was named to The Root 100 list of the nation’s most influential African Americans, as well as Fortune’s list of the most influential women on Twitter. Light snacks and wine will be on deck as we delve into your deepest career-driven questions.